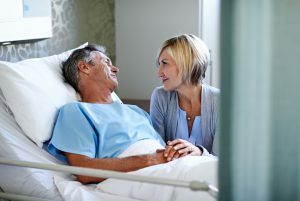 South Jersey Inpatient Hospice Care: How is it Different than At-home Hospice Care? This inpatient care – one of four hospice care levels with admission criteria and coverage determined by the Medicare Hospice Benefit — is provided in an inpatient hospice facility. The services at these facilities include the comprehensive hospice care that the patient was receiving at home (trained hospice team, medications, medical equipment, etc.) but with 24/7 clinical supervision to provide the more intensive comfort care you or your loved one now need. Our South Jersey inpatient hospice facilities in Mt. Holly and Voorhees aren’t places to live long-term; they are places predominantly designed for the short stays required by most patients needing an inpatient level of hospice care. Does your patient or loved one need inpatient hospice care? See if they qualify now. 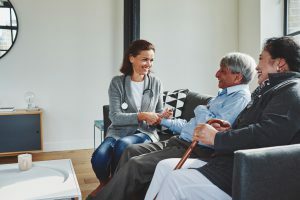 Learn more about two other types of service provided at Samaritan’s South Jersey inpatient hospice facilities – respite care services and private-pay routine hospice care – to serve patients and families with particular needs. Because each person’s needs are unique, please discuss any questions regarding inpatient hospice in NJ with your hospice nurse or call (855) 337-2808. 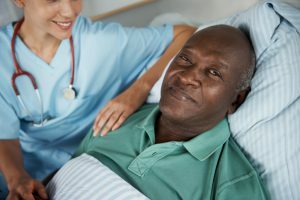 The Inpatient level of hospice care is the best choice when severe pain or other symptoms require an advanced level of care that is more safely and effectively provided during a short stay in an inpatient hospice facility. If your loved one’s needs intensify at home, the hospice team may recommend transferring him or her to the inpatient level of hospice care. 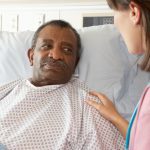 If your loved one is in a hospital because of intense pain or symptoms due to serious illness, and meets the inpatient-hospice criteria, the hospital staff may recommend hospice admission and transfer to an inpatient hospice facility. South Jersey residents experience inpatient hospice care at our dedicated facilities in Voorhees and Mount Holly. Why Choose Our NJ Inpatient Hospice Care? Your hospice nurse works with you to decide if the inpatient level of hospice care is best for your loved one. If severe pain or other symptoms are becoming too difficult to manage at home, or if your loved one could benefit from the Center’s other services, the hospice nurse may recommend a transfer to one of Samaritan’s inpatient hospice centers. At our South Jersey inpatient hospice facilities, your loved one will receive 24/7 care to increase their comfort level. Samaritan’s two inpatient centers feature peaceful, home-like environments. The inpatient staff provides round-the-clock symptom relief for the comfort of your loved one. Your hospice nurse will work with you and your family to determine which inpatient hospice facility best meets your needs. To learn more, read Why Choose Samaritan. Gerry is 74-years-old and lived alone. He was diagnosed with lung cancer two years ago that has spread to his liver and spine. On a recent visit, Gerry’s adult children, Robin and David, were alarmed to find him on the floor unable to stand after a fall four days before. The family discussed Gerry’s declining health, his safety, and his healthcare wishes. Robin arranged to move in with him to be his primary caregiver. They decided he would forego rehab and other aggressive treatment, so his primary care physician referred him to Samaritan’s hospice care at home. Robin and David were relieved that he’d be getting comfort care to address his physical, emotional, and spiritual needs as his illness progressed. After several weeks, however, Gerry’s pain got worse, and the hospice team found it increasingly difficult to keep him comfortable at home. His hospice nurse proposed to Gerry and his family that he consider transferring from home to Samaritan’s inpatient hospice center in Mount Holly, NJ. The team’s goal was to bring his pain under control and then transfer him back home where he most wanted to be. Over the course of a four-day stay, Gerry received care from Samaritan’s inpatient hospice team of doctors, nurses, social workers, chaplains, and home health aides. Robin and David felt comfortable visiting with their children. They welcomed the opportunity to discuss their care planning questions with the team’s doctors and nurses. They appreciated how the spiritual support counselor was available to support them as well, as their dad went through this stage of his illness. Gerry’s pain medication was increased at special intervals and monitored around the clock until he again felt comfortable. Gerry was happy to return home with assistance from his children, to resume routine hospice care once again. For more information about Samaritan’s hospice care services for veterans, call 800 229 8183. The goal of our NJ inpatient hospice care is to control severe pain and symptoms so that your loved one can return home to their family and familiar surroundings, if possible, and resume hospice care at home. Monica is 60-years-old with severe COPD. She’s been staying at her daughter Jessica’s house so she would not be alone as her health worsens. One night her chest started to feel extremely tight — worse than what she’s been used to. She couldn’t catch her breath because the symptoms of COPD escalated. After a hospital visit and talks with her family, Monica was admitted directly to Samaritan’s inpatient hospice facility in Voorhees. 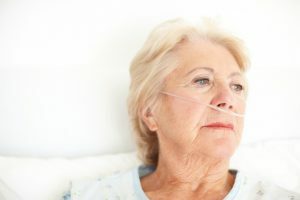 It was determined that her extreme difficulty breathing, due to pneumonia and respiratory failure, could best be cared for in an inpatient hospice setting with round-the-clock monitoring rather than at home. Once at the inpatient Center, Monica was started on medications, given at specific intervals, to ease her breathing and anxiety. The hospice nurse spoke with Jessica about the steps the hospice team was taking to make sure her mom was comfortable. Jessica was nervous and unsure. She was worried about her mom’s labored breathing and wanted her to be as comfortable as possible. The hospice nurse eased her worry. On day two, Monica’s shortness of breath was only partially resolved, so a medication change was made. Jessica’s 9-year old daughter, Jasmine, visited. She was crying and scared to see her grandmother, but the hospice social worker was there to help talk with her about what was happening. By day three, Monica was sleeping more. She was having less and less interaction with her family. The social worker continued to provide support to Jessica and her many family members who had arrived for a visit. Monica’s end-of-life wishes were discussed in more depth. Her wish was for comfort at this time. Over the next 24 hours, Monica’s medications were increased to relieve her shortness of breath and anxiety. The spiritual support counselor visited and recited a few of Monica’s favorite prayers with family and friends. The next morning, she passed away comfortably with six of her closest family members at her bedside. 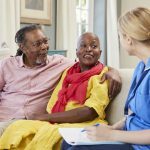 What Are the Requirements for Inpatient Hospice Care? In addition, Samaritan also offers the option of respite care services and a private-pay routine level of care within our two inpatient facilities, depending on individual circumstances and bed availability. Samaritan is proud to offer these services from locations in Mount Holly and Voorhees. These two inpatient hospice facilities serve the needs of hospice patients in South NJ in a comfortable and warm environment. Do you believe that your patient or loved one can benefit from inpatient hospice care in NJ? We encourage you to speak directly with our nurses about how we can help with your loved one’s needs, or to arrange an assessment visit. Call us 24/7 at (855) 337-2808.